At Domtar, we are not only dedicated to giving back, but to enhancing the lives of people that live and work in our communities. We are proud of our corporate citizenship in communities across North America and Europe. According to the Giving USA 2016: The Annual Report on Philanthropy, corporate giving, as a percentage of corporate pre-tax profits, averaged 0.8 percent in 2015. Domtar exceeded this average in 2016 by investing 1.4 percent of earnings in our communities. Our corporate citizenship aligns with the products we make and the areas in which we have interest: literacy, health and wellness, and sustainability. In establishing our three pillars of giving, we define what corporate social responsibility looks like within our company. partnered with First Book to give away more than 40,000 books to teachers and students. Through Domtar’s Comfort and Care program, we are working to decrease diaper poverty and to alleviate financial and emotional stress on families by supporting organizations such as diaper banks and care facilities. Just one example of our contributions over the past year is the Hurricane Matthew relief efforts that Domtar organized. We donated 100,000 diapers to the North Carolina Diaper Bank and $100,000 to the American Red Cross to assist families affected by the storm. In addition to the products and money they donated, our colleagues spent time with children and adults at various events and organizations to encourage health and wellness in their communities. One example of our corporate citizenship in this area is when our colleagues volunteered their time at Camp Blue Skies, an overnight camp for adults with cognitive and developmental disabilities that provides a safe and friendly environment. 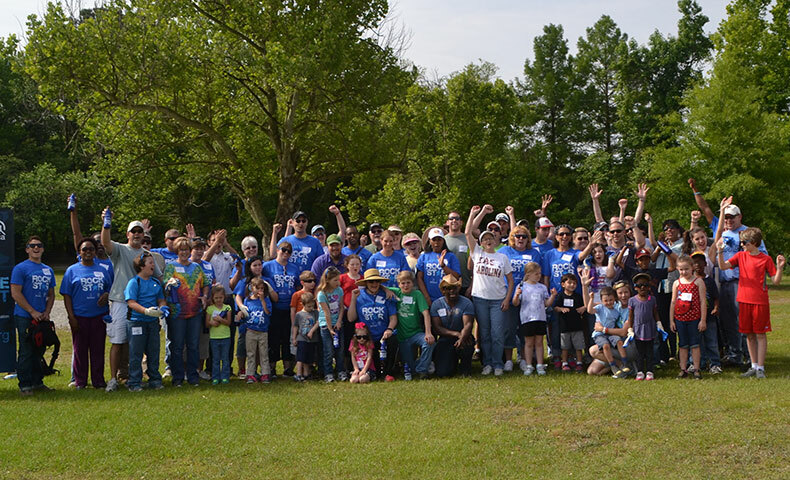 Domtar’s commitment to sustainability takes many forms, like our efforts to practice responsible manufacturing or the hundreds of hours our employees give to service projects in our communities. One such example is our partnership with the Student Conservation Association to restore a wildlife park in Kamloops and a riverfront boardwalk in Plymouth. We also sponsor educational forestry camps for students and offer guidance and support to property owners who want to learn more about sustainable forestry practices. Through Domtar’s EarthChoice Ambassador program, Domtar colleagues help promote sustainable business practices that focus on our customers, employees, company and community. By identifying and sharing innovative methods, educating and encouraging sustainable work habits, and leading by example, this corporate citizenship program promotes Domtar’s sustainability message throughout our organization and in the communities in which we live and work. Outside of our three pillars of giving, we participate each year in raising money for United Way and Centraide. Domtar matches fifty cents of each dollar donated by employees in this companywide campaign, bringing us together and reminding us that we all play a part in creating a better, more sustainable future for everyone. We understand that our world is connected and that our connections to our environment and our communities are vital our success. We’re glad to be part of the solution. It’s what good neighbors do. You can learn more about Domtar’s corporate citizenship by reading Giving Back: Corporate Social Responsibility at Domtar.